15) Jimmy Herget, RHP, Grade C+:Ã‚Â Age 24, sixth round pick in 2015 from University of South Florida; posted 2.90 ERA in 62 innings between Double-A and Triple-A with 72/21 K/BB, 52 hits, 25 saves; velocity reports vary between 90 and 96, uses different arm slots to add confusion, mixing in a workable slider and a change-up thatÃ¢â‚¬â„¢s good enough for him to use more often; throws strikes, ready for middle relief trial. ETA 2018. 16) Tanner Rainey, RHP, Grade C+:Ã‚Â Age 25, compensation round pick in 2015 from University of West Alabama; posted 3.19 ERA with 104/33 K/BB in 62 innings between High-A and Double-A, only 29 hits allowed, saved 13; legitimately clocked as high as 98-99 MPH and matches it with a nasty breaking ball; K/IP and H/IP are not lying about the quality of his stuff, but his control is mediocre on a good day; didnÃ¢â‚¬â„¢t matter much in minor league competition but it might in the majors; Herget will have first crack at a bullpen role and has superior control but Rainey is not far behind and has more pure upside. ETA late 2018. Also, with reports on Shed Long and Alex Blandino, maybe the Reds still have a logjam at second base? Again, go read Sickels’Ã‚Â entire post. Thanks for the link, Steve. Good stuff. Interesting to see Travieso and Okey fall so far, especially Travieso. Once a top prospect is an afterthought now. Travieso had Tommy John surgery last summer which has adversely affected his stock. Four rounds later Dodgers take Cory Seager; 8 rounds later Jays take Marcus Stroman. That’s cherry-picking a little. I can go through first round picks and lots of teams miss on players and don’t take a player that performed well and was taken later in the draft. Any team here. I have no issues with Travieso. As Tom says below, the guy got hurt. It wasn’t that he can’t pitch. Yeah, that’s kind of harsh on Travieso since he’s pitched really well at both 2014 (3.03 ERA at Dayton) and 2015 (2.70 ERA at Daytona) where he was 2 years younger than league average both seasons. He then followed that up with a 3.84 ERA at AA Pensacola in 2016 (League average was 3.69 ERA) while being 2 years younger than league average again. He didn’t pitch at all last season due to his injury, which ended up with what was actually shoulder surgery (labral repair and shoulder scope) in mid June 2017. He was said to be due back in nine months, which would be mid March 2018. So if he is an afterthought now, it’s due to injury, not his performance. I liked reading the write up about Trammell’s arm. It’s listed here at 45/50 which would bring it up to average-ish. Fangraphs has his arm rated at 40 which is below average, and more consistent with the write-ups I’m used to seeing. If his arm is good enough that it doesn’t relegate him to LF then his value/ceiling goes up a good amount. The bat should play, regardless of position, but his speed could play in CF if the arm can be close to average. Great stuff Steve. You have to think at least 1 and maybe 2 of Hernandez Rainey Herget and Shackleford will become solid relief pitchers. I’d still like the Reds to get their budget to $120 million in 2018 and extend Suarez and take advantage of this glacial FA market and get a good lefty reliever at value for 2018/19. 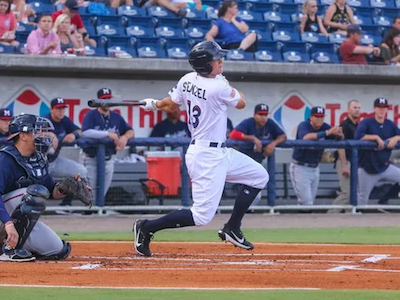 Trammell Winker and Senzel are looking more and more like the next great group of Reds position players. If Siri hits his ceiling….WOW. Fourteen prospects at B- or better. To Sickels that means “good chance to enjoy a productive major league career” or better in the case of the B+/A guys. When can we purchase World Series tickets? I’m optimistic that the farm system seems to FINALLY be getting better. Perhaps DW is steering this ship to better waters; however, I’m still concerned about the nepotism and insularity that is pervasive in the Castellini Circus. Nine of the top ten FA are still unsigned. Teams are finally figuring out that spending big bucks on long contract for prior accomplishments on players entering age regression performance is not a sound business plan. Two years of Ozuna brought the Fish the organizations #1, #5 & #15 prospects. One year of McCutchen brought the Bucos the organizations #4 & #25 prospects. Teo years of Cole grought the Bucos the organizations #5 & #19 sprospects and two major league players. 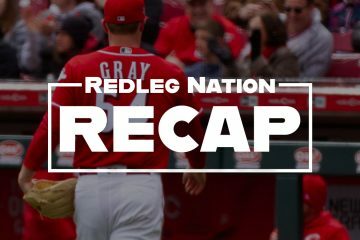 The trade market seems significantly tilted toward a sellers market right now and the Reds are not in a position to aquire a short-term player to fill one need on the team. The Reds may be better off right now by circling the wagons and letting teams know that if their asking price for players like Yelich and Kiermaier comes down to a reasonable level, the Reds are willing to pay top dollar in trade but will not pay a windfall price in trade. I would still make teams aware that Hamilton is available (hopefully) for an equitable return in prospects. The Giants appear to have drawn a line in the sand regarding Ramos. Hamilton’s value will never be higher than it is now and Hamilton will not be part of the Reds next competitive team. If Ramos is actually out of bounds (and that may not be the case), perhaps a package of Slater and Suarez could be worked out to mutual satisfaction between the Reds and Giants. Hamilton seems to fit the Giants’ needs better than any other CF and the Giants are completely in a win now mode with a payroll crunch and limited time to win facing them down. The Reds farm system looks healthy and I agree with Sickels that the Reds prospects are better and deeper than the commonly credited. The only issue I have with staying the course with the existing roster is the manager impact on the 2018 season. I just have zero confidence that Price can or will handle the roster appropriately to maximize either the rosters effectiveness or maximize the identification of future potential. That just does not bode well for the 2018 season unless the roster is cemented in place and Price has his hands tied with locks at every position with trades to fill the existing holes in the roster. You don’t think 2019 is start of a “competitive window” (I hate that phrase)? Hamilton would still be a Red in 2019… I’m not sure I agree about it being a sellers’ market. The return for Cutch was pretty meager but more telling was the return for Cole. Yes, they help the Pirates but the return for a #2/#3 starter with 2 years of team control didn’t net a top 100 prospect? The 2 MLB players in the return aren’t really guys that fit the description of an impact player. Sickles didn’t think much of Romano. Many on here, project him in their rotation. This is why 2018 is the year of sorting for SP and must be the last year of the rebuild. Is Romano the next Aaron Harang with his mound presence and easy gas? I hope so. I like Romano and Mahle. I want to see what they can do. I really liked Garrett a year ago though. I think Garrett will bounce back after his injury last year. I think that it really messed with his mechanics. I’m hoping so anyway. I see Romano as a reliever. Gotta love that “Fish Stripes” piece (1/19/2018) on the 1 year anniversary of the Straily for Castillo, Brice, & White trade. Oh, if only Williams could rack up another sweet deal like that this offseason. They may be the problem. If he cannot make a trade like that, he will not pull the trigger. Williams doesn’t have to be Aaron Judge & hit a HR every AB. A couple doubles would be just fine! Prospects are quicksilver. The Reds need to make decisions about who they want to risk are their keepers and who to use as trade fodder then be on with it. 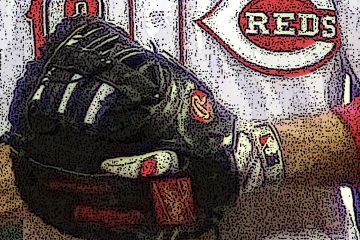 The Reds will never know who to keep and who to trade among their wealth of prospects as long as they continue the acquisition of old guys that they have pursued the last few years which has derailed the rebuild.